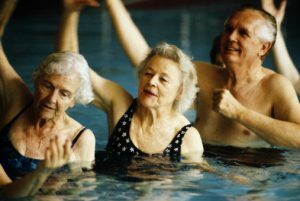 We all know that regular physical activity is important to our overall health, especially for seniors. 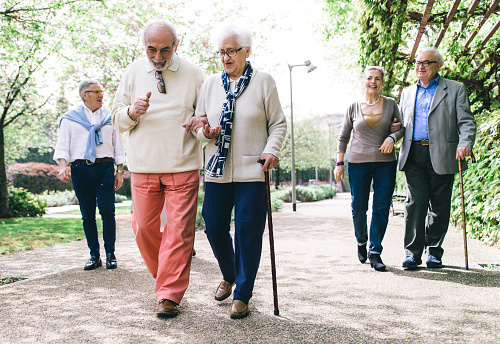 Did you know walking is a great way for older adults to remain active? With the onset of colder months upon us, how can older adults continue their walking routine and remain active? The Centers for Disease Control and Prevention (CDC) suggests that in the colder months, you can utilize indoor malls for your brisk walk. 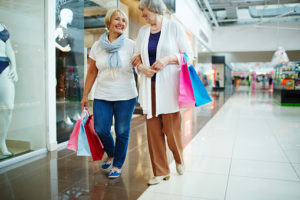 Malls can be pedestrian friendly, they are climate-controlled, are well lit, have benches for resting, fountains for hydrating, restrooms, as well as security guards and cameras for safety. So get yourself a comfortable pair of walking shoes, hit the mall and improve your health! 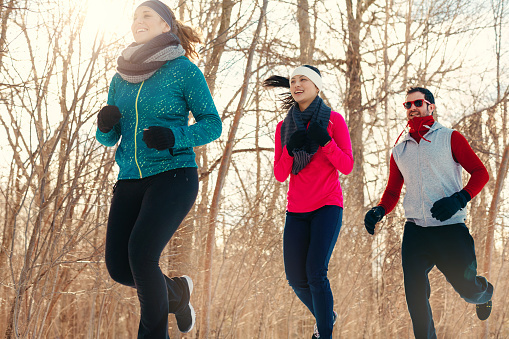 Winter weather doesn’t mean the end of your outdoor exercise routine. 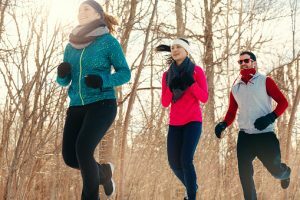 If you plan to continue to run or bike after the mercury drops, consider following these tips so you can stay safe and warm while exercising in the cold. Know the weather conditions before heading outdoors – In addition to the temperature, those heading outside to exercise need to understand how wind and precipitation can affect your health. These factors, combined with the length of time spent outdoors need to be taken into consideration before beginning an outdoor exercise regime. Know the signs of frostbite and hypothermia –Frostbite is most common on exposed skin, such as your cheeks, nose and ears. It can also occur on hands and feet. Early warning signs include numbness, loss of feeling or a stinging sensation. Hypothermia is abnormally low body temperature. When exposed to cold temperatures, your body begins to lose heat faster than it can be produced. Hypothermia signs and symptoms include intense shivering, slurred speech, loss of coordination and fatigue. Get out of the cold and seek emergency help right away if you experience symptoms of frostbite or hypothermia. Dress in layers – Dressing too warmly is a big mistake when exercising in cold weather. Exercise generates a considerable amount of heat — enough to make you feel like it’s much warmer than it really is. The best option is to dress in layers that can be removed as soon as you start to sweat and then put layers back on as needed. Protect your head, hands, feet and ears – When it’s cold, blood flow is concentrated in your body’s core, leaving your head, hands and feet vulnerable. Ways to protect these parts of your body include wearing a thin pair of glove liners under a pair of heavier gloves, purchasing exercise shoes one size larger to allow for thick thermal socks or an extra pair of regular socks. And don’t forget a hat to protect your head or headband to protect your ears. Use proper safety gear – If it’s dark when you exercise outside, wear reflective clothing. If you ride a bike, both headlights and taillights are a good idea. Also choose footwear with enough traction to prevent falls, especially if it’s icy or snowy. It’s as easy to get sunburned in winter as in summer — even more so if you’re exercising in the snow or at high altitudes. Wear a sunscreen and lip balm with sunscreen. Protect your eyes from snow and ice glare with dark glasses or goggles. Drink plenty of fluids – Don’t forget about hydration, as it’s just as important during cold weather as it is in the heat. Drink water or sports drinks before, during and after your workout, even if you’re not really thirsty. These tips can help you safely and enjoyably exercise in cold conditions. Closely monitor how your body feels during cold-weather exercise to help prevent injuries. While exercise is safe for almost everyone, even in cold weather, if you do have certain condition such as asthma or heart disease that could limit you ability, you should check with your doctor first. It is never too late to begin a regular fitness routine. In fact; the United States Department of Health and Human Services’ National Institute on Aging promotes exercise and physical activity as an important factor in healthy aging. Each type of exercise offers several benefits when performed on an ongoing basis. These benefits can be achieved by doing a variety of physical activities. Strength Exercise- Helps to build muscle and makes them stronger. Stronger muscles can make it possible for older adults to remain independent longer. These benefits may be achieved by participating in activities such as lifting weights or resistance training. Endurance Exercise-Helps to promote a healthy heart rate and improve breathing. This type of exercise focuses on overall fitness as well as keeping the cardiovascular and respiratory systems healthy. Activities such as aerobics, swimming, walking, dancing or jogging are considered endurance exercises. Balance Exercise-Helps to reduce falls, a problem that is common in older adults. This type of exercise focuses on building lower body strength. Activities such as Tai Chi, walking heel to toe and standing on one foot are considered balance exercises. Flexibility Exercise-Helps to stretch muscles, promotes freedom of movement and in some instances improves balance. Examples of flexibility exercises include yoga, Pilates, bending to touch your toes or stretching your arms across your chest. Eating a healthy diet is considered the foundation of a healthy lifestyle. By following a balanced diet and eating within your recommended calorie allowance, you can take an important first step in your successful aging plan. Dedication to a daily exercise plan is another foundation of a healthy lifestyle. The US Center for Disease Control recommends daily moderate to intense exercise as part of a longevity program. Pursuing mental challenges is another key when developing a longevity program. You can keep your mind sharp through reading, crossword puzzles, or games like chess or checkers. Mastering any new skill is also beneficial. Staying social is also important. Being involved with other people who depend on you and who you depend on goes a long way in living longer. Interacting with people in different age groups throughout your life cycle will help you feel and be younger. Finding meaning in your life is another important factor in living a long a healthy life. Do something that permits you to see yourself as being part of something larger than simply yourself and you will be filled with greater peace. Following these tips are easier said than done. Believing in yourself, having self-control against negative impulse and outlining a vision for your future are all necessary for success. Flushing Hospital suggests practicing these tips just a few minutes a day and adding just a few more minutes a day every two weeks you will find that you have become a master of successful aging. In 1992, the month of April was designated as Stress Awareness Month. 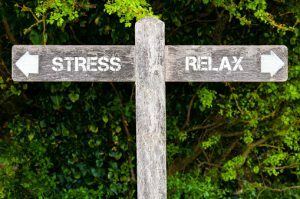 During this time, health professionals join together to increase the public’s awareness about what causes stress and what can help cure the growing stress epidemic. Prolonged, excesive periods of stress is unhealthy for any individual. A change of mindset can bring about a healthier lifestyle. That positive change can help you manage stress and bring far-reaching improvement to your health and well being. When looking for a routine that can bring wellness to your entire being, you don’t have to climb a mountain in Tibet or strip away all food you love. Experts say that the best way to bring a wellness routine into your life is through a series of small changes that will gradually make a difference. Meditation – Take a moment in the morning to meditate. It will set the tone for the day and clear your head to prepare for what the day may bring. Plan a trip – According to research, happiness spikes when planning a trip. Put down your smartphone – When the impulse to pick up your phone comes, and you resist it, you may feel a wave of anxiety. Don’t panic! Breath through the anxiety and you will see that there is calm that will follow. Breathe deeply – Sit in a comfortable place, breathe naturally and settle your attention on your breath. With each inhale and exhale, mentally repeat the words “in” and “out.” Even if you mind wanders, don’t get distracted; just bring your attention back to your breathing. Don’t check your email when you first wake up – When you wake, sit silently and allow your mind to wander. Take 10 minutes to just center yourself before you start your day. Walk – Use part of your lunch break to take a walk. This activity will aid with digestion, keep you active and relieve stress. No one likes change and it rarely comes easy. That’s why slowly incorporating small steps toward your goals overtime can lead to huge changes in the long run. 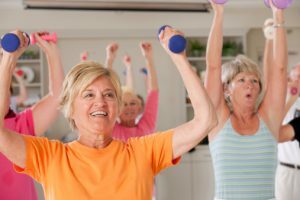 May 25, 2016, is National Senior Health and Fitness Day. 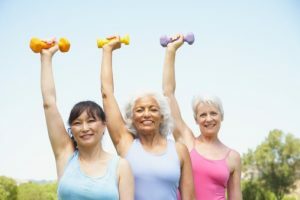 This observance is designed to shed light on the importance of the health and fitness of older adults. Exercise is essential to improving health at any age, and seniors are not an exception. A low-impact exercise routine can benefit your health by stretching and strengthening muscles, reducing stress and can even help to lower high blood pressure. Staying fit doesn’t have to require a gym. You can work out, at your own pace, with an instructor in class, on a home gym machine such as a treadmill, or utilize the great outdoors by taking a walk. Endurance –walking, swimming, or cycling. No matter what workout routine you choose, adding some gentle stretches will improve flexibility and range of motion. After speaking with your physician and identifying what type of exercise is safe for you, an appropriate exercise regimen can lessen your visits to the doctor, lower your chance of being hospitalized and reduce the need for medications for a variety of illnesses. Have you been getting fit for spring but want to add excitement to your exercise? Try out this custom exercise chart created just for you! Using the letters of the alphabet to spell your name you will have a fun workout to keep you fit. Please be advised that these workouts are only suggestions and can be catered to better suit your physical ability due to age, weight and health. 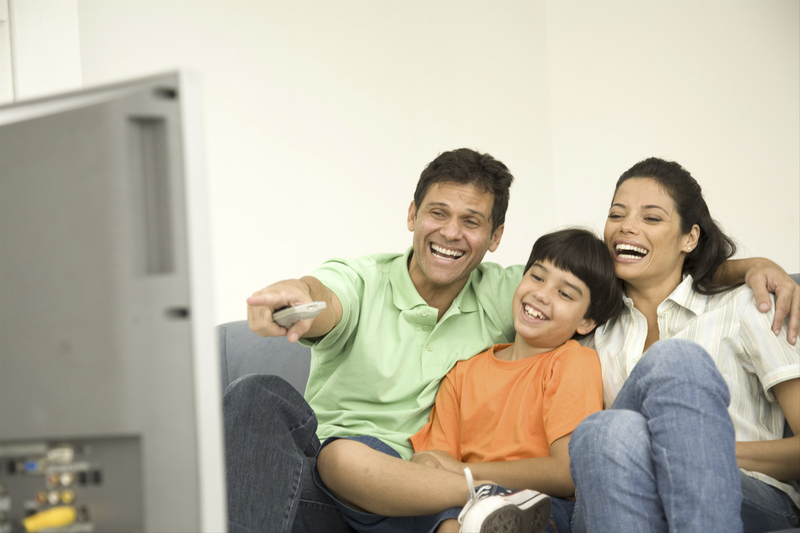 With the weather getting colder and the days getting shorter, snuggling up on the bed or couch and binge watching your favorite TV shows or movies is becoming more appealing. However, long hours of inactivity can increase health risks for obesity, heart disease, and even osteoporosis. Jumping Jacks – try doing multiple sets during breaks or even while you watch. Side lying leg lifts — While lying on your side, stack your legs and bring them out to a 45 degree angle in front of your body. Flex your feet and lift your top leg slightly higher than you hip and then down. Try doing multiple sets of 20 until you reach 100. Sit ups – Lay on the floor and do multiple sets of sit ups until you reach 100. Chair poses – For all over toning stand with your feet together and big toes touching. Inhale and lift your arms up until they are perpendicular to the floor. Exhale and sit your hips back down like you’re about to sit in an invisible chair. Bring your thighs as close to parallel with the floor as you can. Hold for 8 to 10 breaths. Upper back stretches — Improve your posture and ease tension while sitting on your sofa. Sit with a straight back, stomach held in and feet flat on the floor. Grab your left wrist with your right hand and pull your left wrist to the right until you feel a nice stretch. Keep the stretch for 30 seconds then repeat using the opposite hand. Free weights — invest in some free weights and vary some arm exercises like curls or the tricep push. Try low weight and high reps for toning. No matter how long you binge watch, or how frequently, be sure that you always take the time to exercise for a healthier, happier you. Tai chi is an ancient Chinese martial art that has been practiced for thousands of years. This low-impact, mind-body exercise combines breath control, meditation, and movements that stretch and strengthen muscles. The practice of tai chi involves meditation and fluid movements in conjunction with deep breathing that focuses on the area just below your navel. 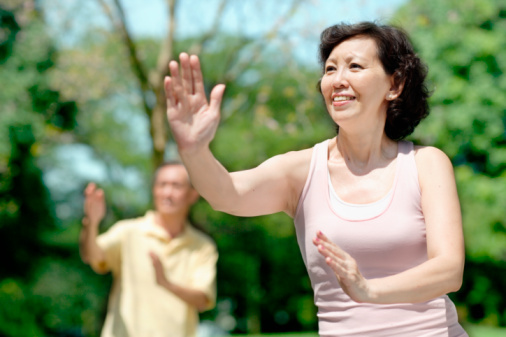 Tai chi theory believes that this area is the body’s storage point for energy, or chi. Tai chi can be gentle or vigorous, depending on the style you practice (there are several different types).Tai chi can be done either in class or at home once you learn the postures, but group sessions are usually preferred. Tai chi also helps relieve stress and can even ease chronic lower back pain, osteoarthritis, rheumatoid arthritis, fibromyalgia, and tension headaches.